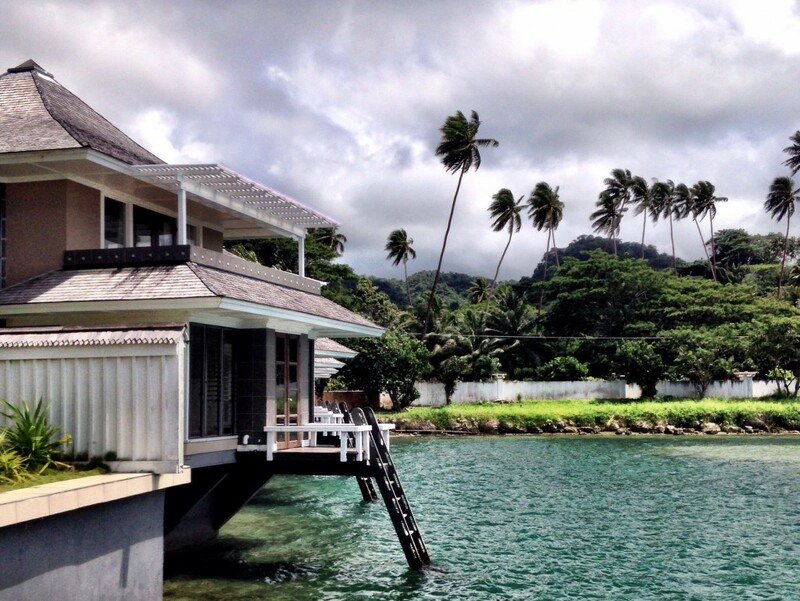 When Fiji friends described Savusavu as their country’s “hidden paradise” we took notice. After a too-short stay, it has a favorite space in our hearts. Sometimes a place is so wonderful you want to keep it all to yourself. 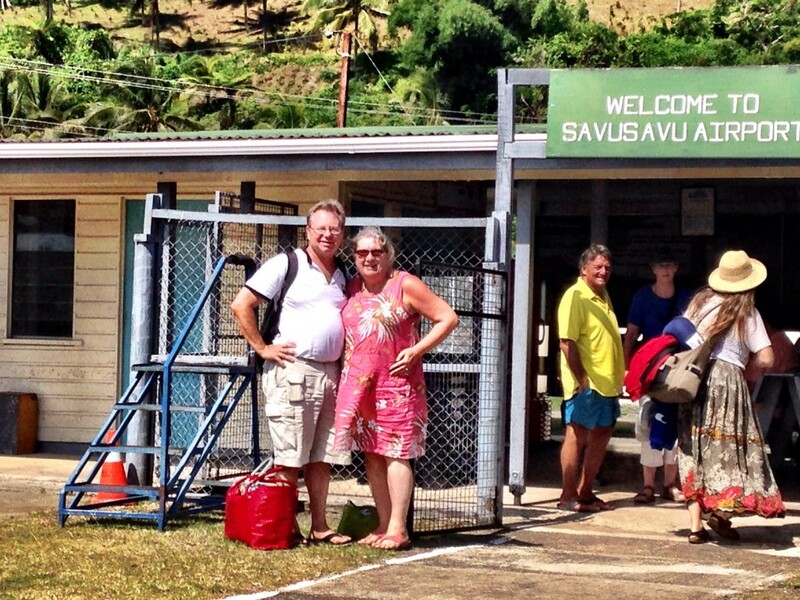 So, even though we think you should be among the travelers who visit Savusavu, a small part of me hopes you don’t. And, if we were to bet against your visit, it’s unlikely we’d lose: less than 20,000 people in the whole wide world ever do get to Fiji’s hidden paradise over the course of a year, and lots of them are repeat visitors. For a town of under 5,000, an extra 1500 visitors each month on average is easy enough to absorb, particularly if they’re cosseted away in an exclusive resort. Not that there’s anything wrong with that. Savusavu has a number of incredibly luxurious resorts that make the getting there worth getting to. 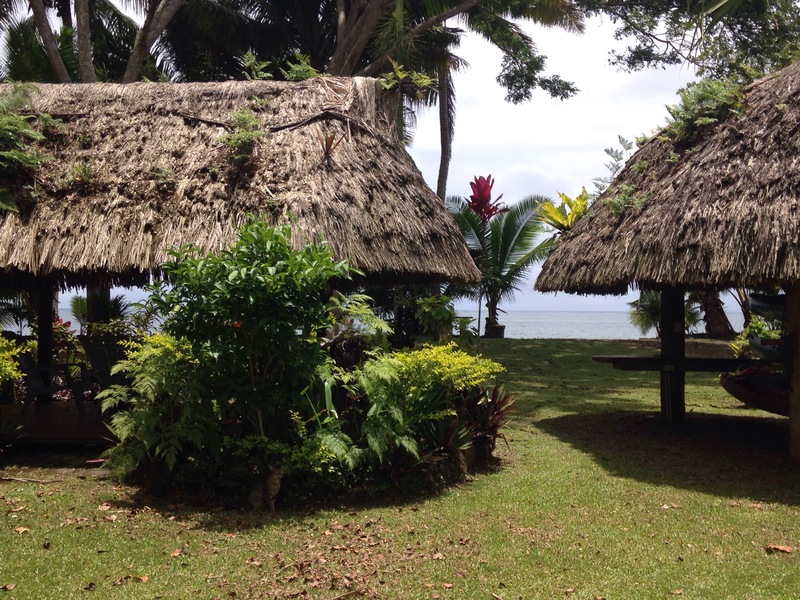 Wherever you stay in Savusavu, though, you’ll wind up within a seashell’s toss of nirvana. My nirvana requisites are palm trees, tropical breezes, impossibly blue ocean vistas, a calm state of mind, delicious food and lots of umbrella drinks. Not too different than lots of other people, and legions of places on the planet have them. We even left such a place, oh beautiful Kaua’i, to begin this journey we’re on. 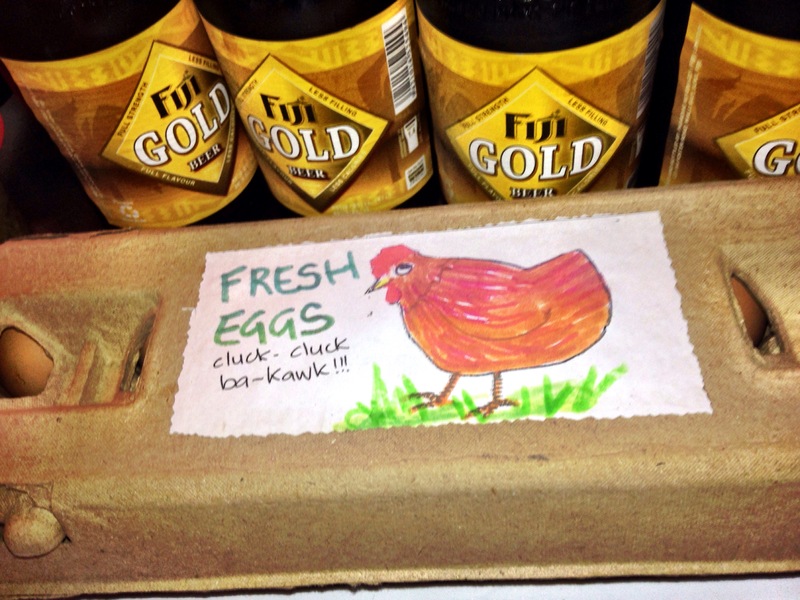 So, why is Savusavu different than all of the others? Here’s the thing. Mention Savusavu in Fiji and the first reaction you get will be a dreamy sigh: “Oh, paradise.” This is truth. Savusavu is the innermost layer of paradise, a paradise within paradise, the inside of the onion, the top rung of the dharma ladder. 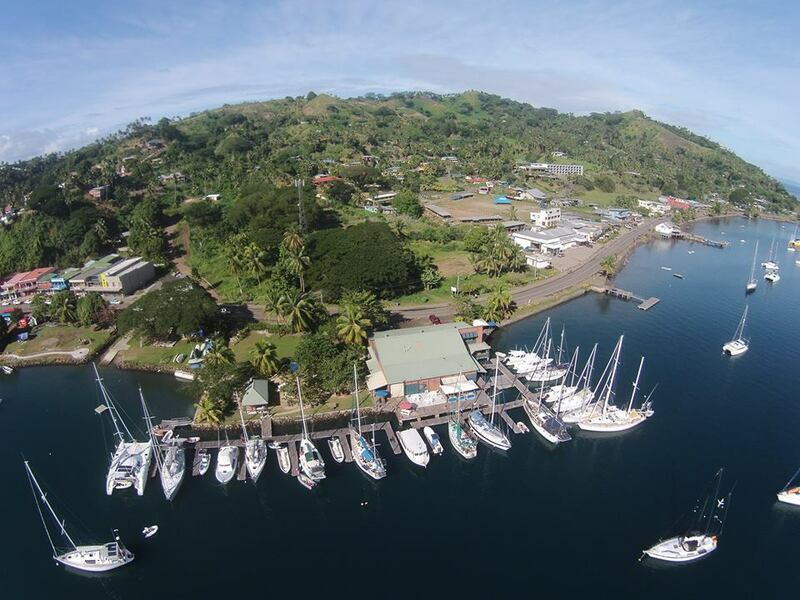 If the world is your oyster, Savusavu is its pearl. 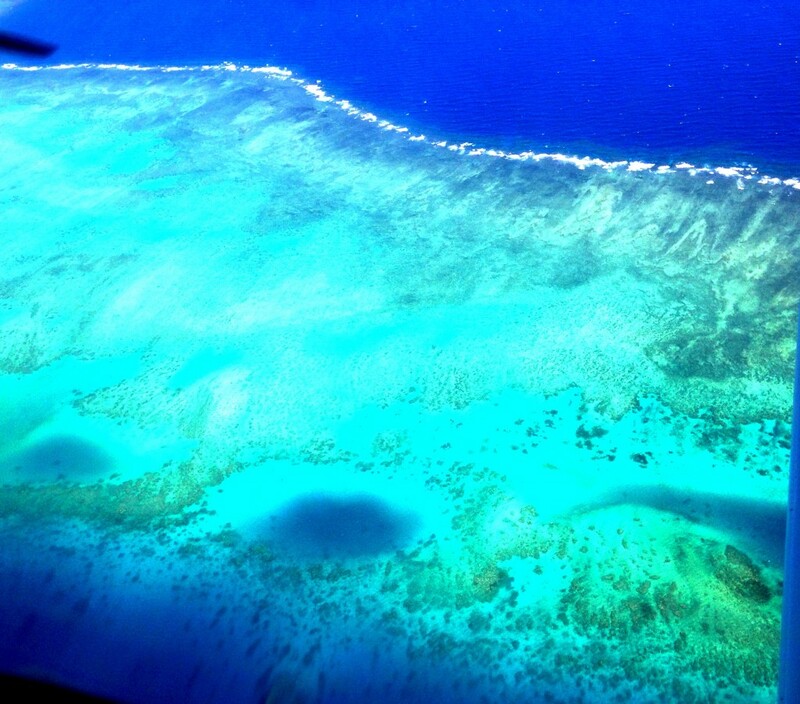 First clue: Aerial views of the Coral Sea on your flight into Savusavu are surreal – reefs and islands pop up in amoebic clusters, punctuating the impossibly blue water. It’s hard to imagine god or human displeased with these breathtaking vistas, but there is better to come. Savusavu’s next message of truth is the antithesis of glam. This is delivered in the form of an unpretentious little island airport whose one runway ends in the sea. It’s like a fresh, cleanly-scrubbed face in a world of stage makeup. For the unfortunate wretches who can’t stay on permanently (that would be us), Savusavu’s welcome is a siren’s song of simplicity and serenity. Savusavu has long been known by yachties as an under-the-radar respite on Vanua Levu, the smaller of Fiji’s two major islands. Nestled alongside a naturally-protected deepwater harbor (so perfect that the U.S. Navy considered it as a hiding place for the South Pacific fleet in WWII), the town of Savusavu has been famous since the 19th century for its geothermal hot springs. In days past, this was a trading center for sandalwood and copra (the meat of the coconut). More recently, celebrities such as Tony Robbins and Jean Michel Cousteau lent their cachet to area resorts specializing in self-development and wellness, undersea sports and naturalist programs such as snorkeling, birding, diving, yoga and meditation. Nowadays, Savusavu’s diverse community is comprised of expats from the United States, Europe, Australia and New Zealand, as well as native Fijians, Indians and Asians. Here’s the kicker: everyone gets along. Our Airbnb host, Mario, who is German, and his wife, Tatiana, who is Lithuanian, have a mountainside slice of heaven a few minutes out of town. From Mario’s truck, we get a glimpse of busy stores and marketplace, colorful signs and storefronts, pedestrian action. There is one main street about four blocks long. Quickly, we’re racing out of town again along the waterfront. The road is no longer paved. “You need 4-wheel drive to get up the hill to the house,” says Mario, “but it’s worth it.” Mario is an understated sort of guy. Mario and Tatiana show us around and we’re shell-shocked by the view. Inside, our newly-built studio has everything we need for a blissful two weeks. “Don’t worry about getting back into town,” says Mario. “I go in the mornings, and you can ride in with me. At other times, you just call Ratnesh and he’ll come get you.” Next morning, Ratnesh does just that, and back down the hill we go. 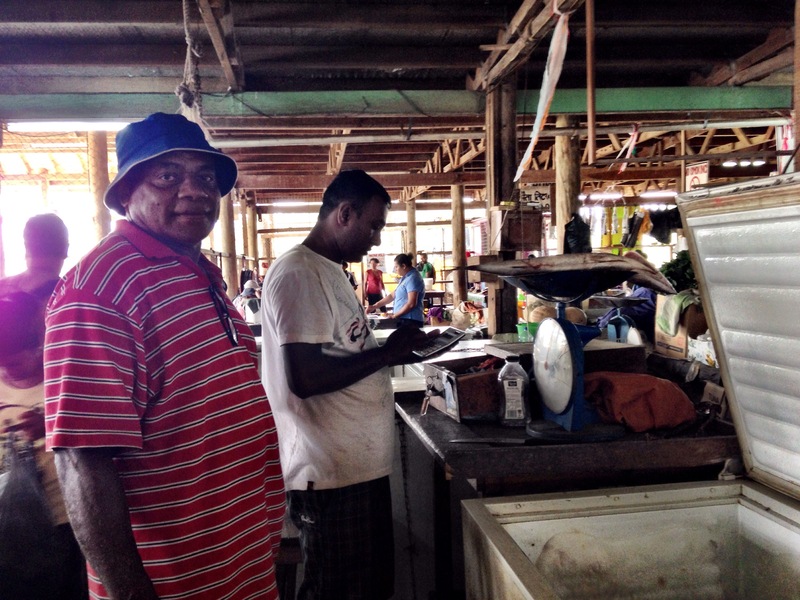 Ratnesh’s family is from Labasa, a larger, rather charmless city on the other side of Vanua Levu. His entrepreneurial ethic is remarkable in a country where “Fiji Time” is the norm: he’s punctual if not early, and when there’s a schedule conflict, he arranges for another driver who is just as reliable. At the end of our two weeks in Savusavu, we’re close enough that Ratnesh confides in us: he will become engaged to a young woman he has yet to meet on another island. His Christian pastor will visit her parents first to vouch and negotiate, and then the two of them will finally get together in person. We vow to stay in touch on Facebook so we can watch the wedding plans unfold. Ratnesh’s recommendations never fail. Our first night in town, he drops us at the Copra Shed Marina. The Copra Shed is a historically significant building now repurposed as a point of entry into Fiji for private vessels. It houses the Yacht Club, at which one can purchase a temporary membership as well as libations, a cafe and restaurant, and other businesses. The marina provides official clearance upon arrival, repair and maintenance services, with reasonable mooring, at anchor and facilities fees for sailors. As we’re perusing the Captain’s Cafe menu, a friendly woman named Susan chats us up. Before we know it, she’s invited us over for lunch, and a visit to a school later in the week, citing projects the local Rotary Club has implemented. We enjoy a lovely dinner at the Captain’s Table restaurant, close enough to hear the Rotarian camaraderie nearby. 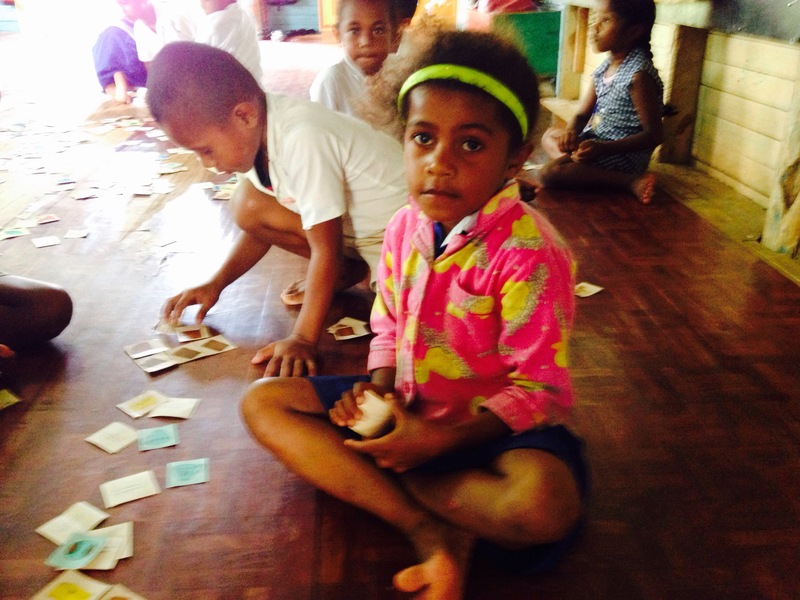 Accepting Susan’s invitation turns into one of the most memorable of my days in Fiji. The visit to Qalitu School is simultaneously enlightening, humbling, and uplifting. The students are joyful and inquisitive. The teachers and administrators wring miracles from sparse conditions. 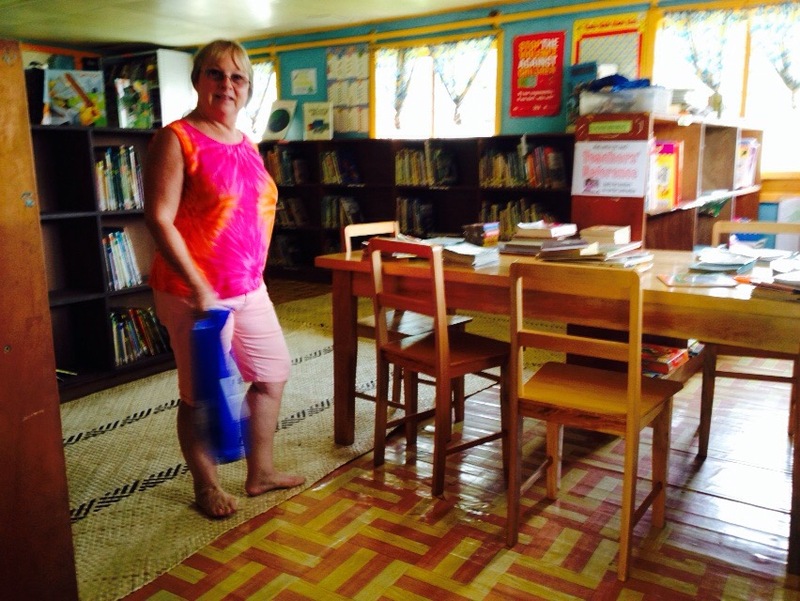 Susan brings books and a globe for the school library, her pet project, and we are greeted like royalty. Students at Qalitu School will go on to matriculate at either of two area high schools, one of which is run by the Catholic Church. 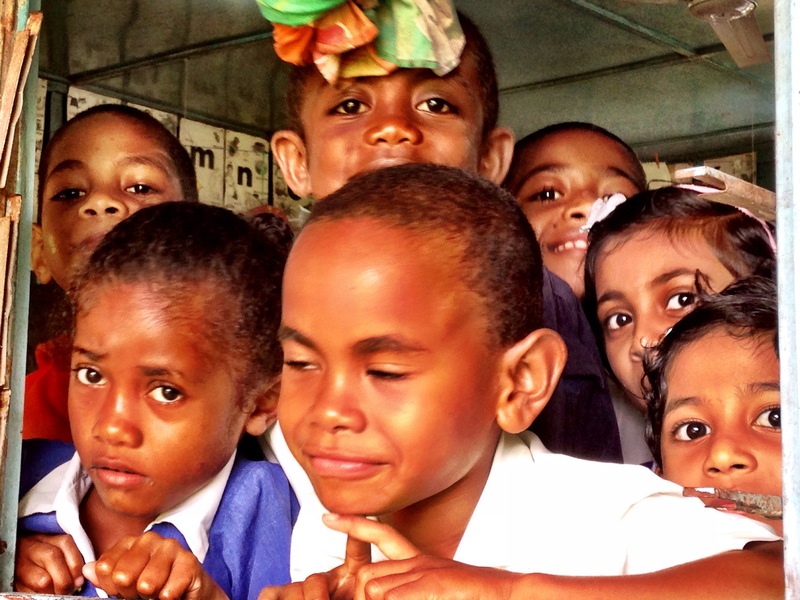 The Fijian government has initiated a financial relationship with the diocese which allows for a secularized curriculum. 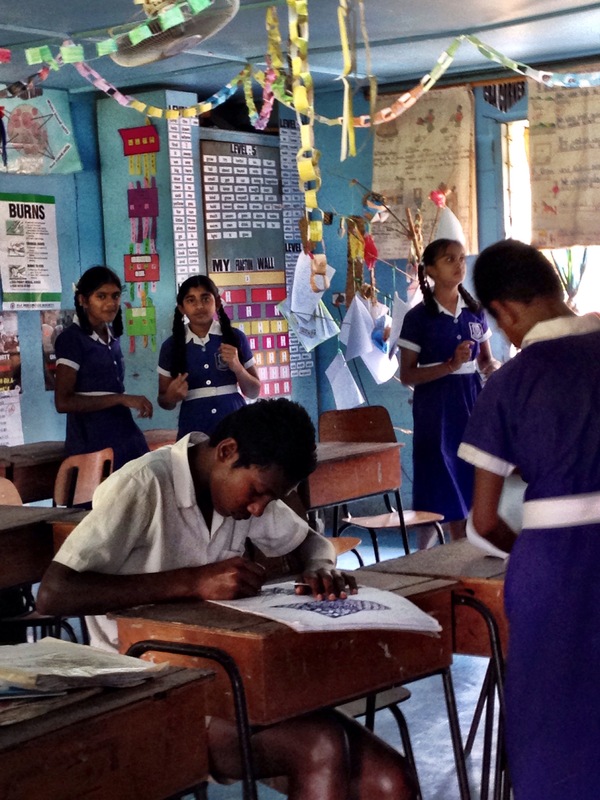 Qalitu School is unique in its diverse population – both Fijian and Indian ethnicities are present. A sizable number of students board during the week for the school semester as well. On we go to Susan’s home, where she and her husband Jeff have created a seaside Eden. Their Tropic Splendor Beachfront Cottage rents to those who desire private retreat. Lunching on Susan’s verandah, we hear the story of how they planned and planted this lush oasis in significant contrast to life in Albuquerque. Afterward we walk the mile-long deserted beach out front. Civilization seems non-existent. A couple days later, Ratnesh drops us at the car rental so we can go exploring. We take the airport road out of town. Mixed among high end resorts along the roadway are traditional Fijian villages. Residents travel on foot, horseback, by taxi and bus. 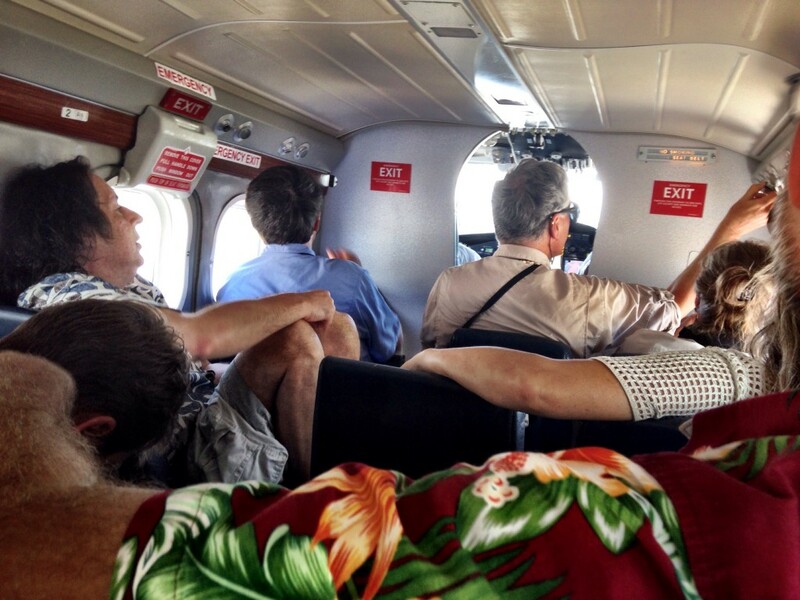 Everyone waves “Bula!” with a smile as we pass. On our way back we’re hungry and thirsty, so we pull in to the KoroSun Resort, where there’s a sign for a seaside restaurant. Ambling down the path between waterfront bures (confession: we peeked into one that was being cleaned, oh, the luxury! ), we encounter Patsy, who owns the resort with her husband, Jack. Patsy directs us back across the street to the main building, where we can have lunch and cold drinks. KoroSun offers the quintessential all-inclusive Fiji experience. 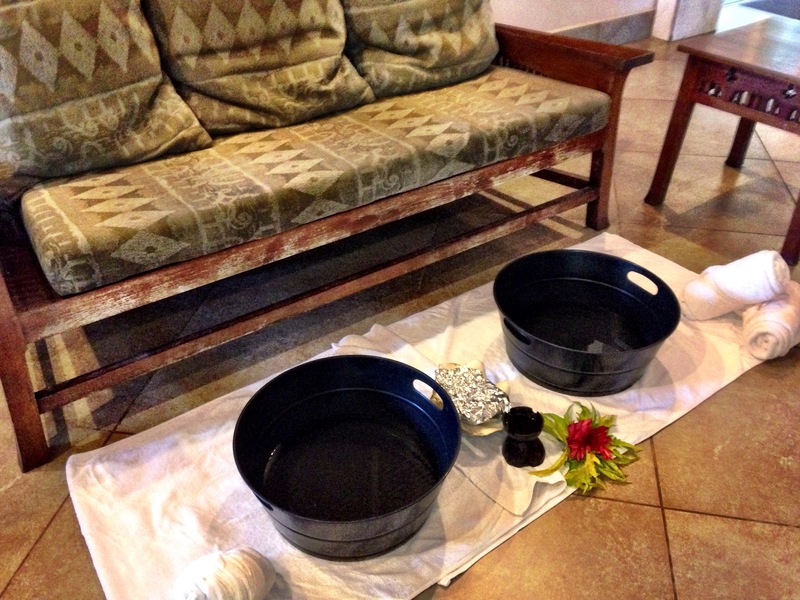 New arrivals are serenaded with traditional welcome songs and treated to a cooling footbath during check-in. You can play golf, dive, snorkel, kayak, get a banana leaf wrap or massage, or just loll around in your luxurious bure with its own private jacuzzi. If that isn’t swell enough, climb down the ladder from your bure for a dip in the sea. The resort is popular with honeymooners, snorkelers, kayakers, golfers and scuba divers. Jack and Patsy divide their time between KoroSun and their other resort in Colorado. We discover a common connection on Kaua’i. They kindly invite us to attend KoroSun’s authentic American Thanksgiving dinner in a few days, where real turkey and fixings will be served. Our favorite restaurant turns out to be the Surf ‘n’ Turf, a classic example of looks can be deceiving. 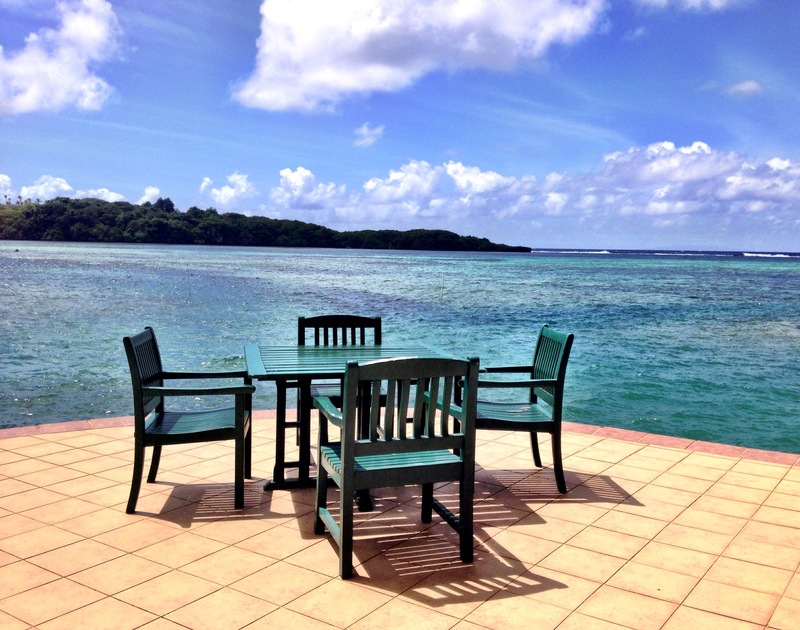 Chef Vijendra Kumar is one of Fiji’s best rated, with 15 years at the Cousteau resort. On both visits, we gingerly tiptoe up the grassy step into the restaurant: Vijendra and another older man are having a nap at one of the tables. We place our order, Vijendra comes to life, and out of the kitchen comes an unexpected masterpiece. 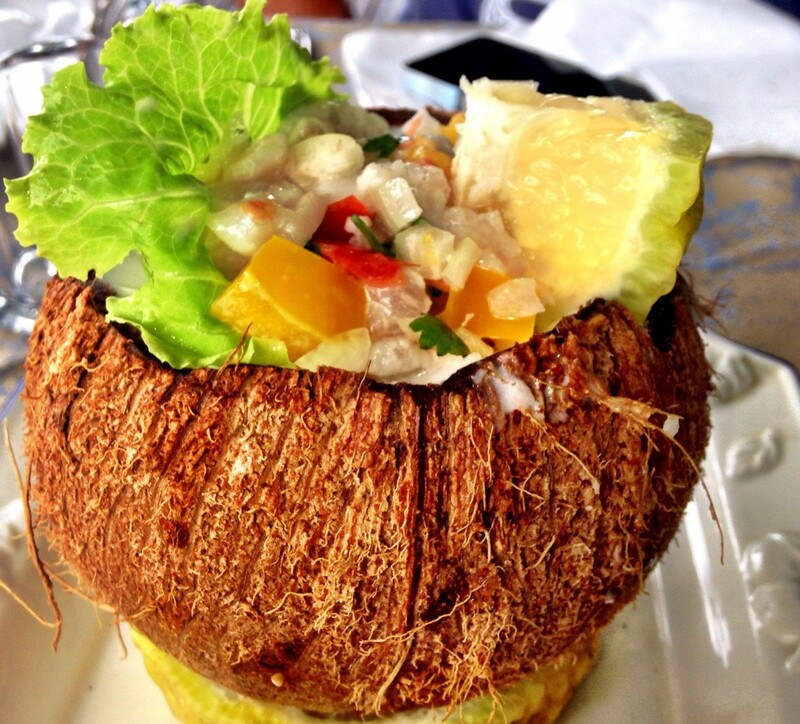 We swoon over the Kokoda (ordered it twice), a Fijian ceviche. Surf ‘n’ Turf’s homemade ice cream is famous, too. (Coconut and chocolate are best). As we finish our meal, we peek into the kitchen where Vijendra is now washing dishes. “Come back,” he smiles, and I feel a pang in my heart. For us, living in this paradise called Savusavu is temporary. We’re not even leaving yet, and already I’m scheming how to return. 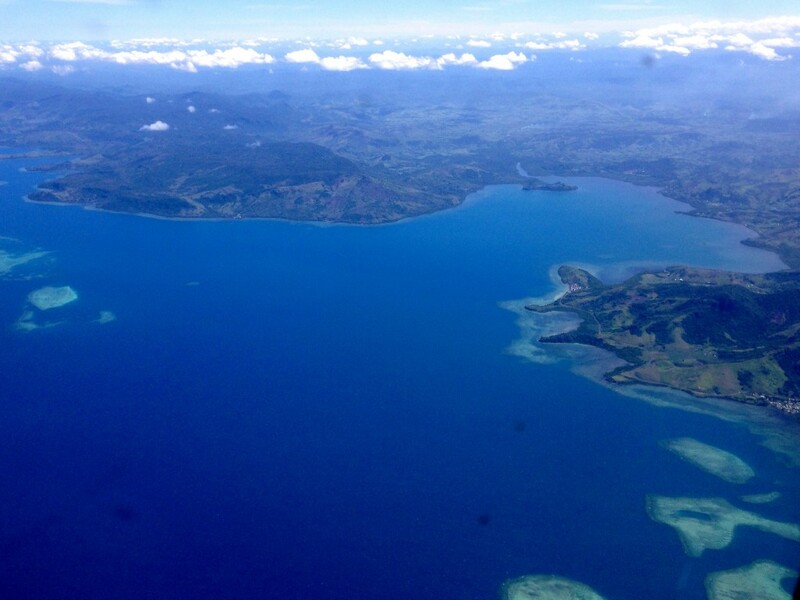 Savusavu is quickly reached by air from Nadi International Airport on Viti Levu, the largest of the Fiji islands. 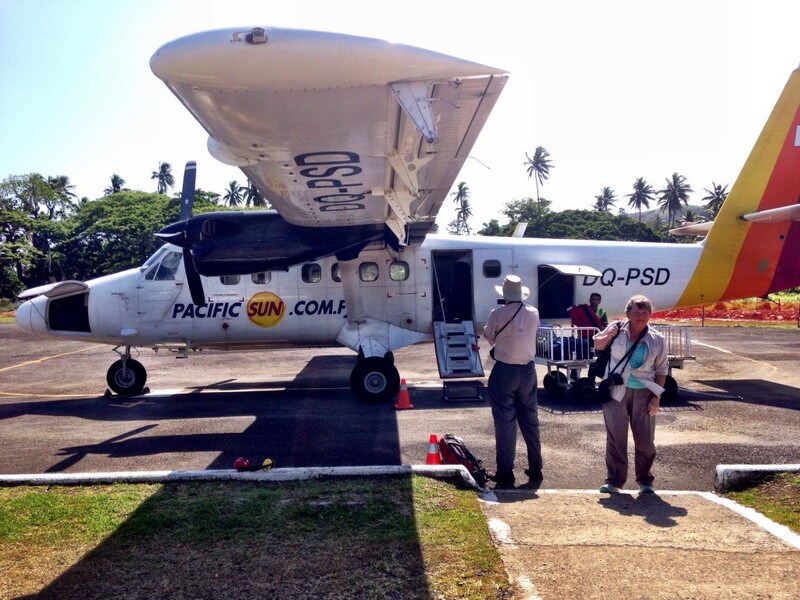 Or you can take a ferry from Suva on Viti Levu, which is a 12 hour trip. The hour-long flight is a throwback: pilot and co-pilot act as luggage handlers and deliver the safety message. No other amenities on board. Mario and Tatiana Hellenbrand’s Airbnb Studio – use our link to enter the Airbnb site for $25 off . 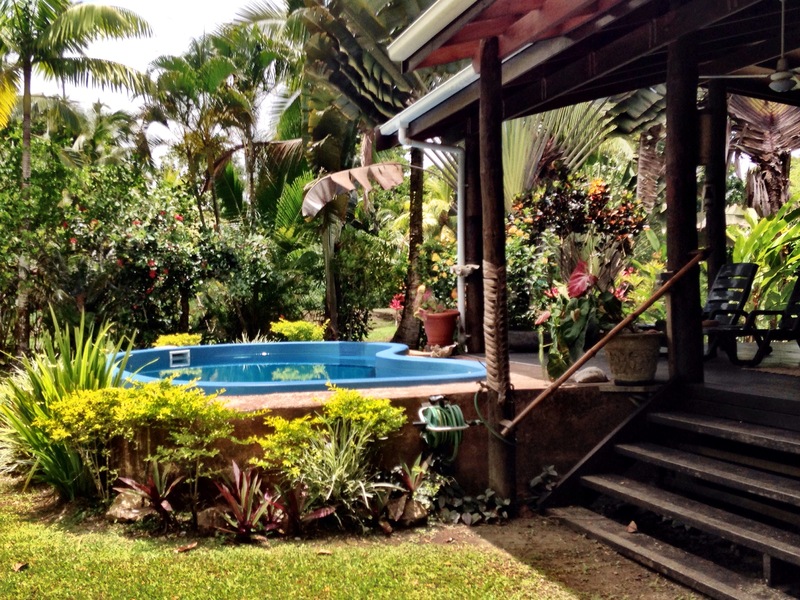 Then click to Korovesi Sunshine Villa in Savusavu. When you arrive, Mario will pick you up from the airport, and provide you with the phone number for our driver, Ratnesh. Jeff and Susan Mather’s Tropic Splendor Beachfront Cottage 679.828.3616 Fully self-contained private beachfront cottage with all conveniences and private pool. 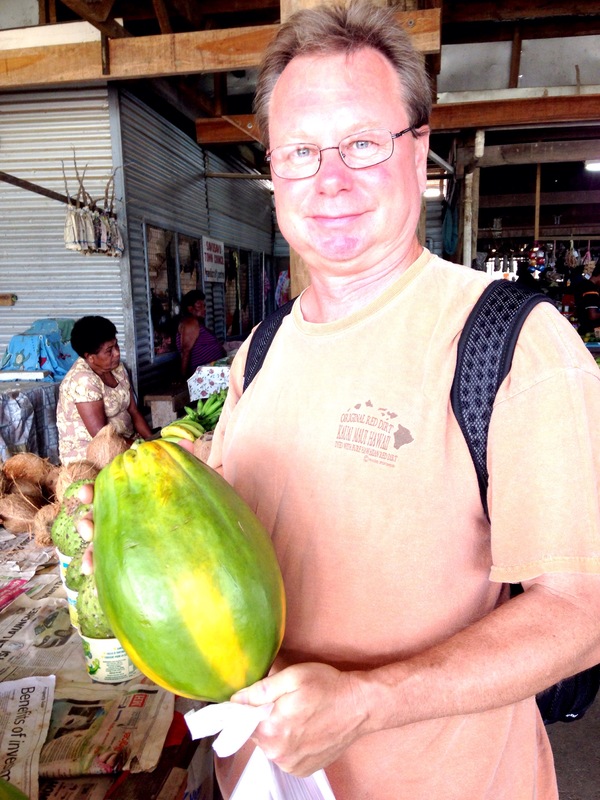 Rate includes daily “Bula basket” of fresh garden fruits and airport transfers. Susan would be delighted to acquaint you with the ongoing Savusavu Rotary Club service projects in the community. 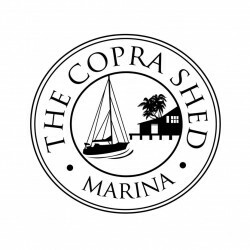 Copra Shed Marina provides official clearance for yachts entering Fiji, repair and maintenance services, with reasonable mooring, at anchor and facilities fees for sailors. Captain’s Table for fine table dining and Captain’s Café for pizza, Mexican, and take-out. Savusavu Yacht Club in the same building has temporary memberships available, and provides a cozy waterfront bar experience. 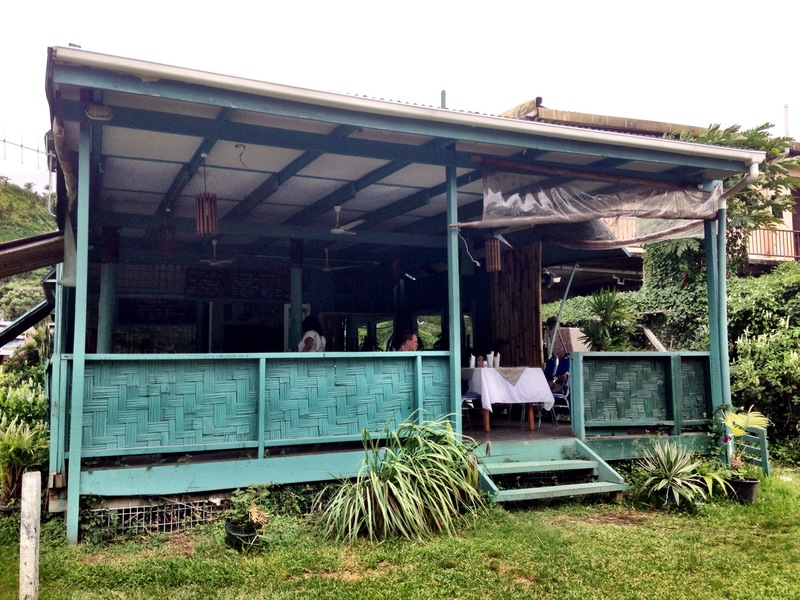 Jack and Patsy Young’s 5-Star KoroSun Resort – From Australia : 1 800 615 084. From North America : 877 567 6786 All-inclusive plan includes a wide variety of complimentary sport and cultural activities, with 3 gourmet meals per day. Accommodations include overwater bures, vales and private villas. Northpole Car Rentals 679 885 0092/ 679 777 7226 Four-wheel drive vehicles with after hours service available. Surf ‘n’ Turf 679 885 3033 located waterside of the main street in Savusavu town, at the intersection of the airport road. Just ask someone and they’ll show you. 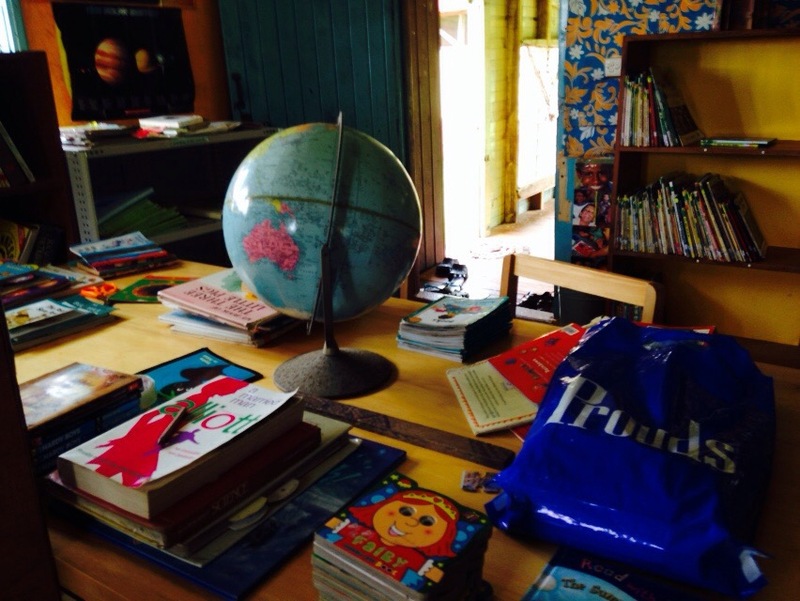 This post is part of Small Planet Studio’s #MyGlobalLife Link Up! Hi Janice – I’ve drooled over photos of Likiliku and would love to stay there. 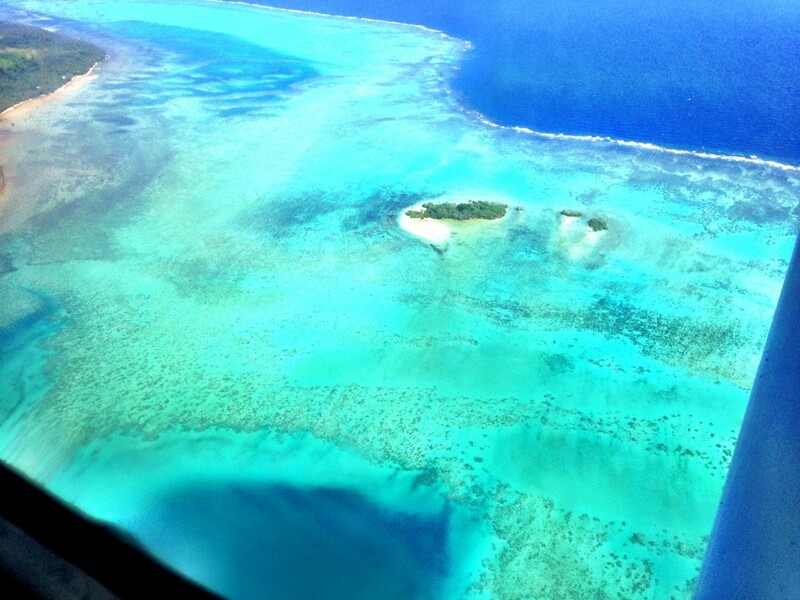 Many, many great reasons to make Fiji a regular stop. Thanks for sharing your little “secret.” I was wondering how you were able to reach into your pocket to get out your camera on that tiny plane! Glad you did! You have found paradise and the only problem I anticipate is a case of the post paradise blues. It sounds like this will be the benchmark against which you will compare all other travel experiences. Thanks for all the great info. 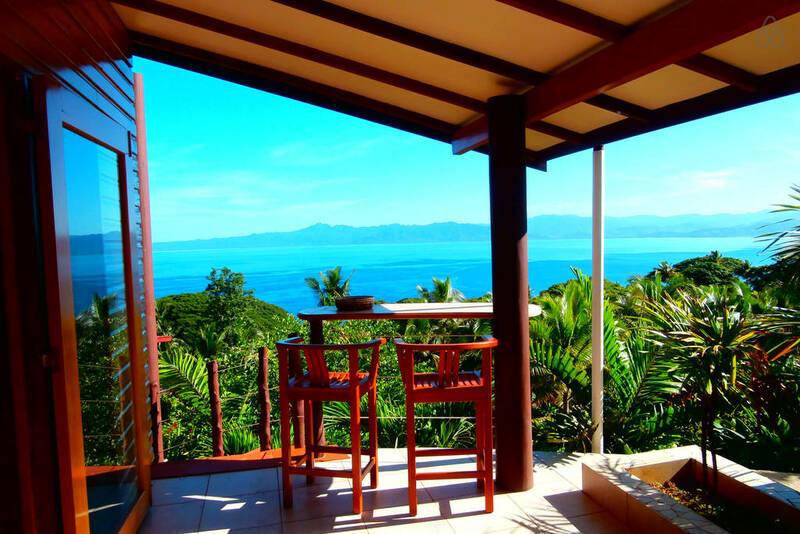 Hi Leigh – Savusavu definitely sets a very high bar, and yes, in a way it was very hard to write this article. We do miss it. Hi Nancie – I’m going to quote that! Exactly. Looks like an awesome place, I could get used to the dining terrace overlooking the ocean. Hi Nat – Yeah, really, isn’t that something? Jack and Patsy really have the details down. That looks like an amazing island to connect with nature and the locals and yes that food also looks excellent. Hi Noel – Yes, the spectacular scenery, fabulous people and yummy eats. A traveler’s trifecta. I ‘ve got my bags packed! Sayusayu does, indeed, look like the heart of paradise and you couldn’t ask for a better office set-up. Another place to add to the “must see/must go” list! 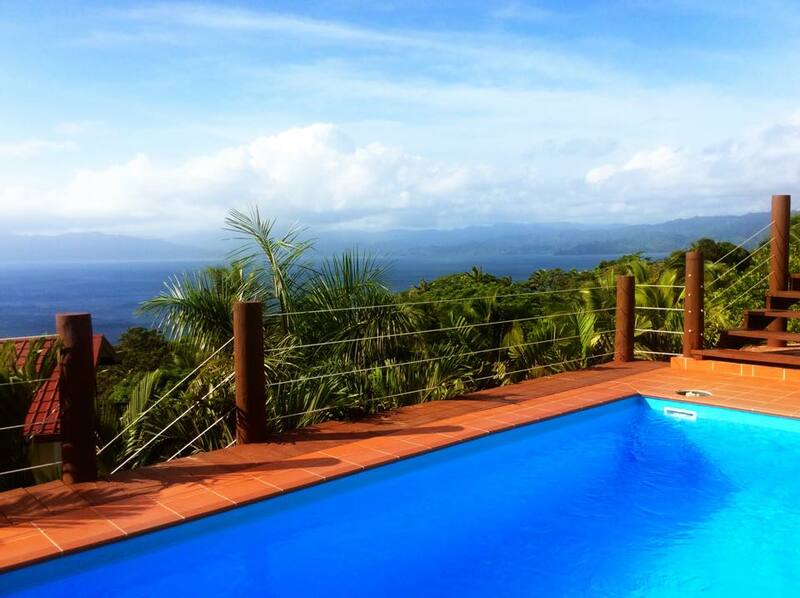 I guess you found paradise- Savusavu looks amazing. Air B ‘n B sure gets everywhere! I’ll probably be among the rest of the world- but great to know it’s there! Hi Billie – Never say never! You’d really love it. That strawberry basil martini looks delicious. In fact, Savusavu looks like paradise found. A lovely spot to be sure. I can’t believe there’s an Air BnB there as it seems so remote. Kudos to you for finding this gem! I believe you found a little piece of heaven. The blue of the water is almost indescribable! Hi Suzanne – Those blues are my favorite palette. It is a heavenly place, for sure. As I sit here shivering in 30 something degree Philadelphia, your photos and narrative actually have me sighing. 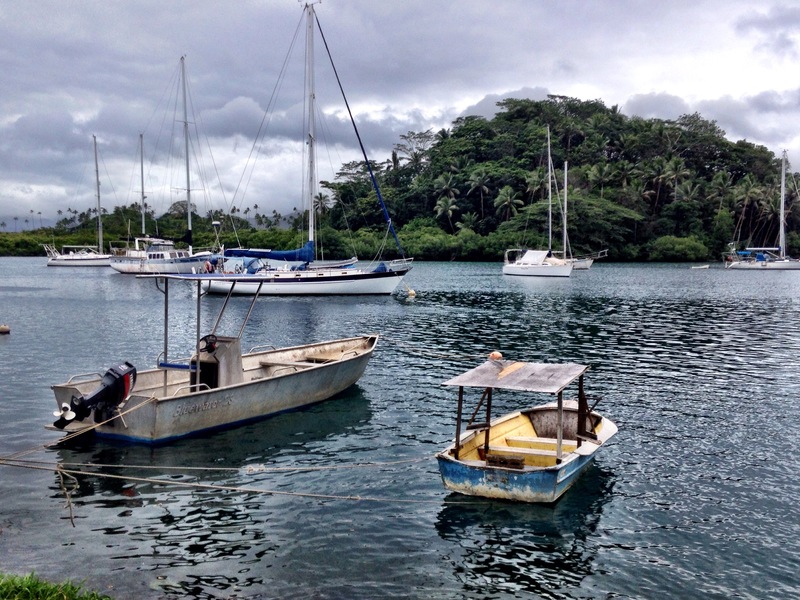 Savusavu—someday, maybe, I hope. Hi Kay – We’d love to get to some of the outer islands on our next trip. Glad Fiji Air finally came through. Sounds like you’re set for a wonderful experience (although probably not enough time in Savusavu 🙂 ). Everything about this spot is right up my alley! 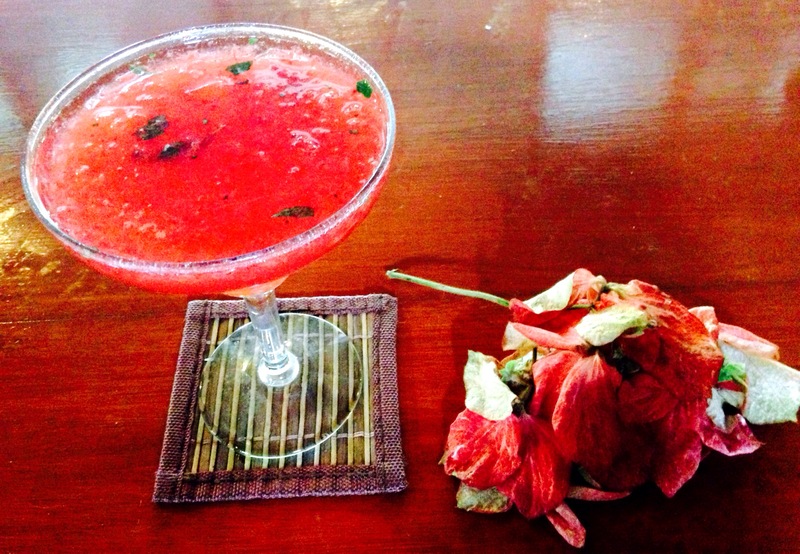 From the arrival and teensy airport to the strawberry and basil martini. I think I will have a dream tonight about eating in the Surf n Turf restaurant. What a range of blues…..
Oh my oh my! What a great post! I especially love the aerial photos. My husband’s dream is go to Fiji and I cannot wait to share this article with him. You’ve included such wonderful information, thank you. Enjoy your travels in 2015 and I look forward to reading about them. Thank you SO MUCH for this guide! We are off to Savusavu this weekend! After we read this post we booked with Mario’s villa so we are excited to see what it looks like in person, it seemed to tick all the boxes! We are now just finding out where the best place to go diving is. Thank you so much for this post, we will definitely check out the Surf n Turf restaurant too! We’re living in Nadi at the moment, and the whole don’t-judge-a-book-by-its-cover thing is very true throughout Fiji! Hi Juliette – Thank you for letting us know! How we’d love to trade places with you right now! Give our love to Mario and Tatiana. I can taste the kokodo. I hope the Surf n Turf is still open; I heard a rumor that they might be closing. Hopefully most if not all of Savusavu has recovered from Winston. They were hit hard.